1Department of Soil Science, College of Agriculture, Shahrekord University, Shahrekord, Iran. *Corresponding author: hosseinpur-a@agr.sku.ac.ir. Heavy metals (HM) in agricultural soils are controlled by many factors, including the geological parent material (Nan et al. 2002), atmospheric deposition, urban-industrial activities, and agricultural practices (Kashem and Singh 2001; Mantovi et al. 2003). These elements can uptake and accumulate in plants, which is a serious problem environmentally, primarily because HM in the soil can then enter the food chain (Qian et al. 1996). Heavy metals in soils exist in different chemical forms (Motaghian and Hosseinpur 2013). In environmental studies, the determination of these forms gives more information on trace metal mobility, as well as on their availability and toxicity, in comparison to the total element content (Pueyo et al. 2004). Likewise, the prediction of availability of HM is of crucial importance for the assessment of environmental quality of polluted soil (Gupta and Sinha, 2007). To determinations of availability of HMs, extraction procedures are the most widely accepted and used method in soil science. Although considerable effort has been made to estimate the availability of HM to plants and thereby predict their impact on the soil ecosystem, no single method is recognized universally (Gray and McLaren 2006). There are several studies (Feng et al. 2005 a,b; Gupta and Sinha 2006; 2007; Meers et al. 2007; Zhu et al. 2012; Qasim et al. 2014; Nascimento et al. 2014) to understand the most reliable method for the prediction of availability of an element to the plants from contaminated soil. Linear correlations between various indicators of HM availability and its content in plant parts are often used for identifying the best-suited method of assessment for soil testing procedures. Simple extraction procedures have been used to identify and evaluate the mobility and the availability of HM in environmental samples (Alvarez et al. 2006). Many of extracting solutions have been used to assess soil availability of HM (Gupta and Aten 1993). Single extractants may be divided into three main classes: (1) weak replacement of ion salts (MgCl2, CaCl2, NH4NO3, and NaNO3) (Pueyo et al. 2004; Gupta and Sinha 2007), (2) solutions of either weak or strong acids (Kashem et al. 2007), and (3) chelating agents (DTPA, EDTA) (Kashem et al. 2007; Alvarez et al. 2006; Soriano-Disla et al. 2010). The first type of extractants are able to release into solution metals which are associated with the exchange sites on the soil solid-phase and hence can be considered as available (McLaughlin et al. 2000). In some cases, salt solution does not represent plant available metals (Gupta and Aten 1993).The chelating agents, such as DTPA and EDTA, form complexes with free metal ions in solution, and thus reduce the activities of the free metal ions in solution, therefore metals release from the solid phase. Chelating agents, which extract either a large portion or almost the entire total metal from the solid phase, are postulated as suitable for the prediction of plant uptake. Gupta and Sinha (2007) used various single extractants such as DTPA-TEA, EDTA, NH4NO3, CaCl2, and NaNO3 to evaluate the bioavailability of HM including Zn and Pb from tannery wastewater contaminated soil and translocation of metals to the plant of Brassica juncea L. Czern. (var. Vaibhav). They reported that the extraction capacity of the metals was in the order EDTA> DTPA-TEA >NH4NO3> CaCl2> NaNO3 and EDTA was suitable extractant for tannery wastewater contaminated soil to Brassica juncea L. Meers et al. (2007) found significant interactions of DTPA-extractable Pb with bean uptake in the assessment of Pb bioavailability. Hao et al. (2009) used DTPA-TEA, NH4NO3, NH4OAC, and 0.05 M HCl extraction methods to estimate availability of Zn, Cu, and Pb to vegetables in areas receive large amounts of heavy metals. They reported that correlation between extractable soil HM concentrations with four kinds of extractants and HM concentrations in vegetables wasn’t significant (p>0.05). In some researches, extraction procedures contain salt solutions are suitable to predicate bioavailability of HMs (Meers et al. 2007; Qasim et al., 2014). Qasim et al. (2014) investigated bioavailability of Zn, Pb, Cd, As, and Sb in contaminated Technosols from two former smelting and mining areas. They selected several single extraction procedures (CaCl2, NaNO3, NH4NO3, DTPA, and EDTA). They concluded that the 0.01 M CaCl2 extraction procedure was the most suitable and provided the most useful indications of metal bioavailability for studied elements. An essential need is to establish a standard simple extraction for polluted soils with heavy metals. This paper aims to assess the ability of six single extractants (DTPA-TEA, AB-DTPA, Mehlich 2, Mehlich 3, 0.01 M CaCl2, and 0.1 M HCl) for the prediction of bioavailability of Zn and Pb from polluted soil to the bean. The research focused on the area between mining sites and Sepahanshahr town located about 20 km from Isfahan in Central Iran (Figure 1). This area is affected by mining activities exploiting raw materials containing Zn and Pb in southern parts of the study area. The Bama mine is one such the oldest mining site operating more than several decades. Recently, two other new mining sites were established in the area and operating in vicinity of the Bama mine. Figure 1. Study area and location of sampling. Ten soil samples used in this study were collected from the surface soils (0-30 cm) on July. The soil samples were air-dried and ground to pass through a 2 mm sieve for laboratory analysis. Particle size distribution was determined by the hydrometer method (Gee and Bauder, 1986). Electrical conductivity (EC) was determined in 1 to 2, soil to water ratio by conductivity meter (Rhoades, 1996) and pH was measured in 1 to 2, soil to water ratio (Thomas, 1996). Organic carbon (OC) was determined by wet oxidation (Nelson and Sommers, 1996), equivalent calcium carbonate was determined by titration (Loeppert and Suarez, 1996) and cation exchange capacity (CEC) was determined by the 1 M NaOAC, at pH= 7 (Sumner and Miller, 1996). Total Zn, Pb, Cd, and Cu were determined using 4 M HNO3 (Sposito et al. 1982). Available Zn and Pb were extracted using 6 different methods (Table 1).Then concentrations of Zn and Pb were determined using an atomic absorption spectrophotometer (AAS, GBC 932, Melbourne, Australia). All plastic and glassware were washed before use, soaked in 5% HNO3, and rinsed with deionized water. Table 1. Chemical extraction methods used to determine available-Zn and -Pb. A greenhouse study was conducted to measure soil Zn and Pb bioavailability. Three kg of the soils (pass through a 4 mm sieve) were put in pots (20 cm diameter), and arranged in completely randomized experimental design with three replicates in greenhouse. To ensure sufficient supply of Nitrogen, phosphorus, potassium, and iron, 20 mg kg-1 N as urea, 100 mg kg-1 P as Ca(H2PO4)2, 100 mg kg-1 K as K2SO4, and 5 mg kg-1 Fe as sequestrine were added to soils. Bean (Phaseolus vulgaris L.) seeds were sterilized by soaking in a mixture of NaClO (3%), then were thoroughly rinsed with water for 24 h, and were inoculated with rhizobium. Five inoculated seeds were sown and subsequently thinned to 4 plants. The beans were grown with a day/night rhythm of 16/8 h. The temperature was 20 0C during the day and 160C during the night. The relative humidity was set to 60%. Above g 0C with ventilation and analyzed for Zn and Pb (Campbell and Plank 1998). Then concentrations of Zn and Pb were determined using an atomic absorption spectrophotometer (AAS, GBC 932, Melbourne, Australia). Plant indices were including concentration of Zn and Pb, yield of dry matter, and uptake. The uptake index was calculated by the following equation. Metals (Zn or Pb) uptake (mg pot-1) = yield of dry matter × metal concentration (Zn or Pb) The correlation between Zn and Pb extracted by different methods was studied. Also, The Pearson correlation coefficients were determined for Zn and Pb in bean in relation to the amount of Zn and Pb extracted from soils using various extraction methods. The Pearson correlation, and significance analysis (p = 0.01; 0.05) were performed using SPSS 17.0 (SPSS Inc.). Selected chemical and physical properties of the soils studied are given in Table 2. These results showed that there was a wide variation in the selected chemical and physical properties of the soils. Texture of studied soils was loamy sand to sandy clay loam. Clay contents in all soils averaged 20 and ranged from 12 to 35%. Sand contents in all soils averaged 62 and varied from 48 to 81%. The soils were alkaline and low in organic matter. The pH ranged from 7.6 to 8.5. The EC ranged from 0.29 to 2.55 dS m-1. The OC ranged from 0.20 to 0.53%. The equivalent calcium carbonate contents varied from 45 to 65%. The CEC ranged from 3.4 to 12.1 cmol+ kg-1. The total Zn and Pb ranged from 38 to 289 mg kg-1 and 21 to 263 mg kg-1, respectively. The maximum allowable concentrations for trace metals differ greatly between countries. Range of maximum allowable concentrations for Zn and Pb in agriculture soils are 100 -300 and 20- 300 mg kg-1, respectively (Kabata-Pendias and Mukherjee, 2007). According to this, all studied soils were pollutant for Zn (except soils 4, 9 and 10 for Zn) and Pb. Table 2. Physico-chemical properties of soils. Amounts of available-Zn and -Pb in the studied soils are shown in Table 3. The results indicated a high variability of metal extraction in different extraction methods and soils, depending on extraction procedure and soil types, respectively. Among all the extractants, Mehlich 3 extraction showed better extractability of two tested metals, from soils. Overall, extraction capacity was as follows: Mehlich 3>AB-DTPA>DTPA-TEA>Mehlich 2>CaCl2>HCl. Gupta and Sinha (2007) and Qasim et al. (2014) reported that the extraction capacity of the metals was in the order EDTA> DTPA>NH4NO3> CaCl2> NaNO3. The Mehlich 3 extraction procedure contains EDTA agent. In general, higher percentage of metals was extracted with EDTA in comparison with DTPA. The EDTA extractants use organic ligands capable of forming strong complexes with metals as the basis of the extraction process (Menzies et al. 2007). The EDTA agent is assumed to extract both carbonate and organically bound fractions of heavy metals, which may be due to its low pH (Gupta and Sinha, 2007). Hammer and Keller (2002) also reported that the extraction of Fe and Mn was found maximum with EDTA due to solubilization of iron oxides. Moreover, EDTA can extract HM from soil geochemical phases including labile and non-labile fractions (Bermond et al., 1998). The Zn extracted using Mehlich 3, AB-DTPA, DTPA-TEA, Mehlich 2, CaCl2, and HCl ranged from 1.75-62.25, 0.51-27.30, 0.44-21.69, 0.17-25.39, 0.05-0.24, and 0.05-0.33 mg kg-1, respectively. The average of Zn extracted using Mehlich 3, AB-DTPA, and DTPA-TEA was 25.68, 9.73, and 7.30 mg kg-1, respectively. In addition, the average of Zn extracted using Mehlich 2, CaCl2, and HCl were 6.53, 0.13, and 0.11 mg kg-1, respectively. The Pb extracted using Mehlich 3, AB-DTPA, DTPA-TEA, Mehlich 2, CaCl2, and HCl ranged from 1.45-33.00, 1.44-17.52, 0.76-15.81, 0.16-4.30, 0.18-0.93, and 0.16-0.78 mg kg-1, respectively. The average of Pb extracted using Mehlich 3, AB-DTPA, and DTPA-TEA was 12.56, 7.32, and 4.91 mg kg-1, respectively. In addition, the average of Pb extracted using Mehlich 2, CaCl2, and HCl were 0.93, 0.62, and 0.44 mg kg-1, respectively. Correlation coefficients between different extractants are shown in Table 4. The results indicated that significant correlation was found between Zn and Pb extracted by AB- DTPA with CaCl2, HCl, Mehlich 3, Mehlich 2 and DTPA-TEA. The Zn and Pb extracted by DTPA-TEA and Mehlich 3 and Mehlich 2 correlated significantly. Moreover, significant correlation was found between Zn and Pb extracted by Mehlich 3 and Mehlich 2. Table 4. Correlation between several Zn and Pb (mg kg-1) extracted by chemical extractants. ** Significant at the 0.01 level, * Significant at the 0.05 level, and ns Not significant. The bean plant indices are shown in Table 5. Yield of dry matter ranged from 1.91 to 5.88 g pot-1. The concentration of Zn and Pb ranged from 18.4 to 69.5 and 4.5 to 10.2 mg kg-1, respectively. The uptake of Zn and Pb ranged from 83 to 308 and 9 to 60 mg kg-1, respectively. Correlation between different extractants of Zn and Pb and bean indices are shown in Table 6. The results of Table revealed that significant correlations were found between concentration of Zn in bean and Zn extracted by DTPA-TEA, AB-DTPA, HCl, and CaCl2. Moreover, the Zn extracted by DTPA-TEA, AB-DTPA, Mehlich 3, Mehlich 2, and HCl correlated significantly with Zn uptake. 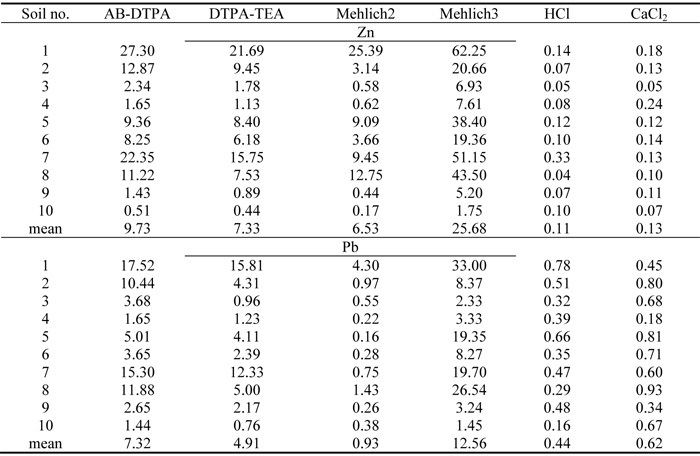 The results of Table 6 showed that concentration of Pb in bean and Pb extracted by DTPA-TEA, AB- DTPA, Mehlich 3, and Mehlich 2 correlated significantly. Moreover, significant correlation was found the Pb extracted by Mehlich 2 and Pb uptake. The process of metal accumulation in plants depends on the concentration of available metals in soils, their mobility, and the plant species growing on these soils. The potentially toxic elements considered readily available for plant uptake are those that exist as soluble components in the soil solution or that are easily desorbed or solubilized by root exudates, representing often only a small portion of the total content of the soil (Qasim et al. 2014). Meers et al. (2007) examined shoot accumulation of Cd, Cu, Ni, Pb and Zn by bean in 21 soils, differing in soil composition and level of contamination. They used 12 different commonly extraction procedures (0.01M CaCl2, 0.1M NaNO3, 1M NH4NO3, 1M NH4NOAc, 1M MgCl2, 0.11M HOAc, 0.5M HNO3, 0.1M HCl, DTPA-TEA, EDTA-NH4OAc, and aqua regia). They found significant correlation between DTPA-extractable Pb with plant uptake. Finally, they cited that 0.01M CaCl2 extraction procedure proved to be the most versatile as it provided a good indication of bioavailability for all five metals. Gupta and Sinha (2007) used various extractants such as DTPA, EDTA, NH4NO3, CaCl2, and NaNO3 to evaluate the bioavailability Zn and Pb from tannery wastewater contaminated soil to the plant of Brassica juncea L. and reported that EDTA extractant was suitable method for tannery wastewater contaminated soil to Brassica juncea L. Menzies et al. (2007) reported that good results have been found for the bioavailability of Cd using DTPA. Feng et al. (2005) used several extraction methods including DTPA, EDTA, CaCl2, and NaNO3 for the evaluation of bioavailability of HM in soil to barley. The results of them showed that significant correlation was found between concentration of Zn and Pb in shoot barely with DTPA and EDTA extraction methods respectively, and correlation between plant index and CaCl2 and NaNO3 extraction methods weren’t significant (P>0.05). The results of this research showed that ability of extraction methods for Zn and Pb was as follows: Mehlich 3>AB-DTPA>DTPA-TEA>Mehlich 2>CaCl2>HCl. The results of correlation study revealed that significant correlation was found between Zn and Pb extracted by AB- DTPA with CaCl2, HCl, Mehlich 3, Mehlich 2, and DTPA-TEA. The Zn and Pb extracted by DTPA-TEA and Mehlich 3 and Mehlich 2 correlated significantly. Moreover, significant correlation was found between Zn and Pb extracted by Mehlich 3and Mehlich 2. The Zn extracted by DTPA-TEA, AB- DTPA, Mehlich 3, Mehlich 2, and HCl correlated significantly with Zn uptake. Moreover, significant correlation was found between DTPA-TEA, AB-DTPA, HCl, and CaCl2 with Zn concentration in bean. The concentration of Pb in bean and Pb extracted by DTPA-TEA, AB- DTPA, Mehlich 3, and Mehlich 2 correlated significantly. Based on results of this research in polluted soils, application of extraction procedures contains chelating agents would be recommended to estimate bioavailability of Zn and Pb. This study supported by funds allocated by the Vice President for research of Shahrekord University.